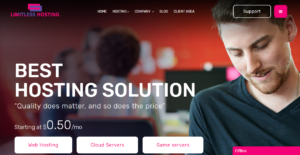 Limitless Hosting offers web hosting, cloud servers, and game servers. The service is fast and secure with 24 hours monitoring. The prices are affordable with the web hosting packages starting from just $0.50/month. For Cloud Servers, users get basic DDoS protection. For gamer servers, you can use a control panel with plenty of features such as auto-restart, backup system, etc. As such, Limitless proves an important point for the online business community – hosting services don’t have to be expensive in order to be efficient. An argument in favor of this claim are the various shared hosting plans for small businesses, as well as the affordable reseller hosting packages, game servers, and available domains. Regardless of the plan you’ve chosen, you get to work within an easy and intuitive client area where you can choose a preferred payment method, as the provider works with more than 200 payment methods. Better yet, constant monitoring and premium 24/7 support will be equally available to all users, and so will be the access to Limitless’s large user community. They currently offer an uptime guarantee of 99%. For Cloud Server packages, Limitless Hosting guarantees 99% uptime. plus basic DDoS protection as well as extra security features. How Much Does Limitless Hosting Cost? Limitless Hosting offers Cpanel web hosting with its Shared Hosting packages with servers located in the United States, Europe, and Singapore. Cloud Server packages come with the SolusVM control panel. Every enterprise is different, and might call for a special solution that will be designed for their business size, type of customers and employees and even particular industry they deal with. It's not wise to count on getting an ideal service that is going to work for every business regardless of their history is. It may be a good idea to read a few Limitless Hosting reviews first and even then you should pay attention to what the hosting service is supposed to do for your business and your employees. Do you need an easy and intuitive hosting with only elementary functions? Will you really use the complex tools needed by pros and large enterprises? Are there any particular integrations that are especially beneficial for the industry you operate in? If you ask yourself these questions it will be much easier to get a solid service that will fit your budget. We realize that when you make a decision to buy Hosting Services it’s important not only to see how experts evaluate it in their reviews, but also to find out if the real people and companies that buy it are actually satisfied with the product. That’s why we’ve created our behavior-based Customer Satisfaction Algorithm™ that gathers customer reviews, comments and Limitless Hosting reviews across a wide range of social media sites. The data is then presented in an easy to digest form showing how many people had positive and negative experience with Limitless Hosting. With that information at hand you should be equipped to make an informed buying decision that you won’t regret. Limitless Hosting provides customer support via email, phone, tickets, and live chat. What are Limitless Hosting pricing details? Limitless Hosting doesn't provide a free domain with their packages. Do they enable you to quickly create a website without any HTML or coding skills? Yes, they offer an easy website builder for novices. Yes, it is a good hosting platform for WordPress blogs and websites. Limitless Hosting guarantees 99% uptime. There is no info in its terms and conditions page about reimbursement for downtime. Limitless Hosting has 20+ payment methods that include PayPal, Skrill, Bitcoin, Ethereum, Litecoin, PerfectMoney and many more. It has no 2Checkout payment method. Limitless Hosting has metered bandwidth, but provides unlimited email accounts. Yes, Limitless Hosting offers good eCommerce solutions. Limitless Hosting offers Linux hosting services. Limitless Hosting provides basic DdoS Protection. Cloud VPS has own panel through client area, Shared Hosting has cPanel. If you need more information about Limitless Hosting or you simply have a question let us know what you need and we’ll forward your request directly to the vendor.